Is Tampax marketing pumpkin spice tampons? Claim: Tampax is marketing pumpkin spice tampons. Has Tampax come out with a pumpkin spice Tampon? 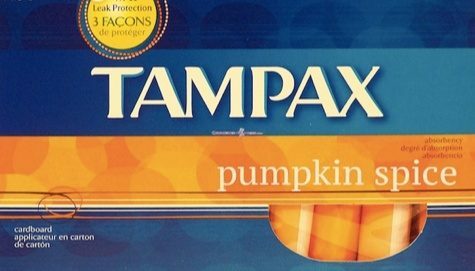 Origins: In a case of a humorous image getting separated from its original context and being circulated without attribution, rumors have been spreading of Tampax “Pumpkin Spice Tampons.” Pumpkin spice everything has become common with the arrival of autumn, and the parody appears to have gone over the heads of a consumer base inundated by many such items each fall season. The Pumpkin Spice Tampax rumor closely resembled a similar tale that Durex was introducing pumpkin spice condoms. That, too, was a parody.